Alton Bowling Club established in 1884 has been resident in the Alton Public Gardens since 1953 offering a venue for competition and social bowling in the centre of the market town of Alton. The club for both ladies and gentlemen is particularly active in county and area leagues and participates in county and national competitions. Although there is obviously a need for the competitive spirit, there is also the importance of generating the social atmosphere necessary to attract and keep members of all levels of skill from beginners to those with years of experience. Alton Bowling Club prides itself of managing both. We have dedicated and certified coaches who are more than happy to impart their knowledge and encourage beginners to enjoy and develop their skills in the game of bowls. There is a comprehensive programme of friendly matches played at venues throughout the county specifically aimed at integrating new members with more experienced players and the opportunity to meet and make friends from different bowling clubs. 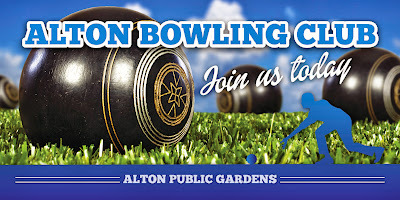 This is a fun sport that knows no boundary for age or ability and at Alton Bowling Club there is space and a welcome to all. No commitment, come along on Monday afternoons with a pair of flat shoes have a free ‘rollup’, cup of tea and a chat. If you like it come again you never know what the future may bring. In this message of 2019, I would like to express my thanks to the secretary, committee members and club members for their continuing support in making Alton Bowling Club a pleasure to be part of. I wish all league captains and those participating in county and national competitions an enjoyable and successful 2019.